Heard of Deniliquin? It’s a little country town in the NSW Riverina region, not far from the border with Victoria (and only 285 clicks from Melbourne!). You might know it as ‘Deni’, from the ‘Deni Ute Muster’, which holds the world record for the number of utes in one place at a throbbing 9736! Oh and in good Aussie tradition, none of the locals bother calling it ‘Den-il-i-quin’ either. Utes aside, Deni’s also a cracker spot for nature lovers and adrenaline junkies. 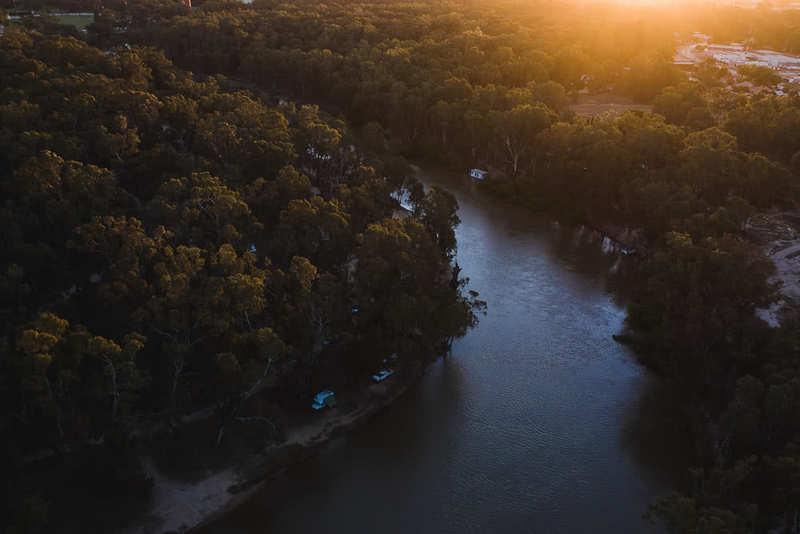 The people of Deni, and the Wamba Wamba Indigenous people before them, relied on the Edward River to survive, and it runs right through the heart of town. Deni’s a paddlin’ paradise. 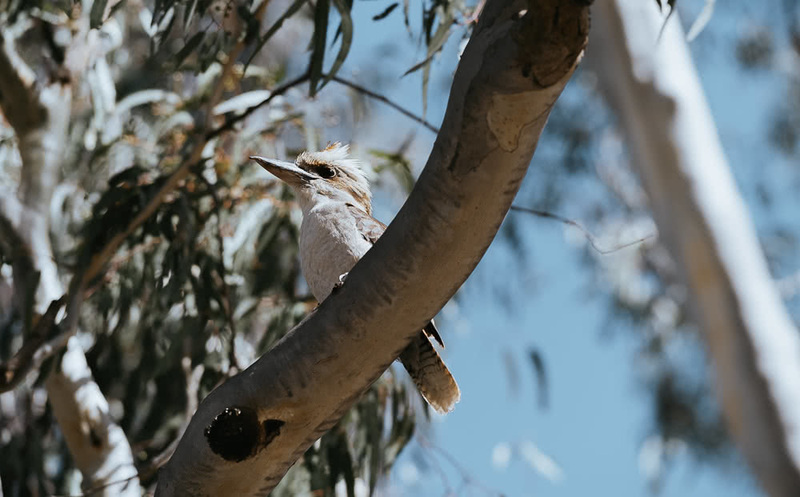 Dip an oar in and glide beneath river red gums, a stunning eucalypt species that’s often found along the banks of inland rivers, and plays host to native birdlife and marsupials. Upstream of McLeans Beach is the perfect spot to put in; waterskiing is only allowed downstream from here so you’ll be left to enjoy your dreamy analog paddling and the lap of the water against your hull. 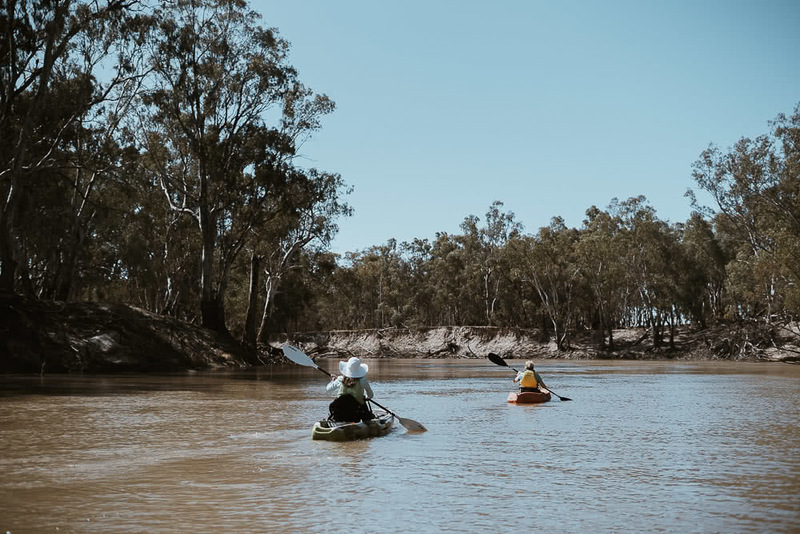 Pull in for some lunch at Willoughbys Beach before heading back, or if you’re game, paddle and camp for 3 days over 61km through the Murray Valley National Park. 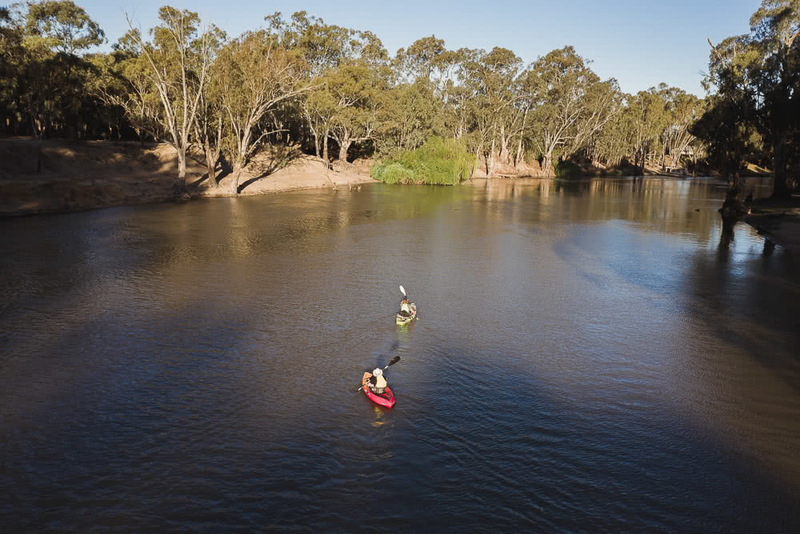 You’ll paddle until the Edward River meets the mighty Murray River at Picnic Point. Are you thinking what I’m thinking B1? Kayaks and canoes can be rented in town if you don’t have your own. Easy! You can also ride a SUP on the river (bloke not included). Adrenaline fiends should check out the designated watersports zone downstream of McLeans Beach. 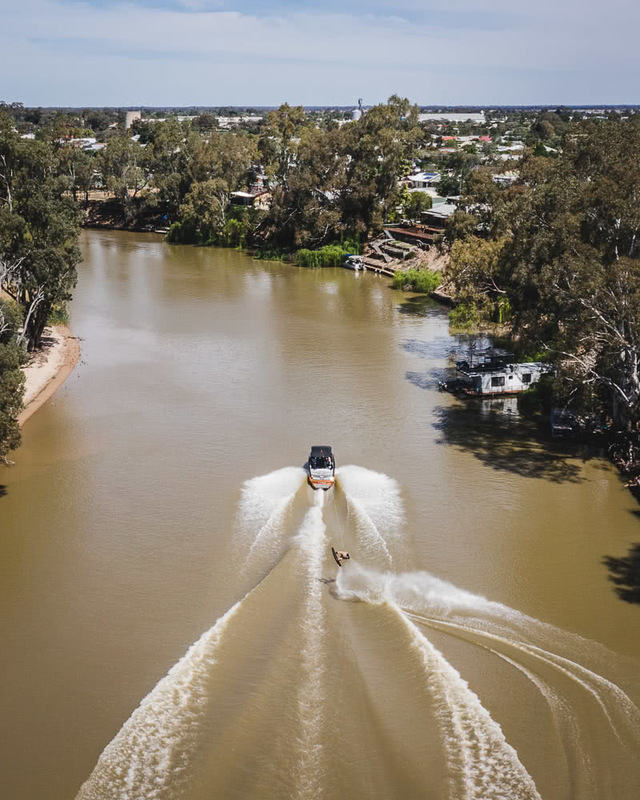 This wide and glassy section of river runs all the way past Deniliquin Boat Club, who host all kinds of rope-tow sessions and lesson for those without their own gear. 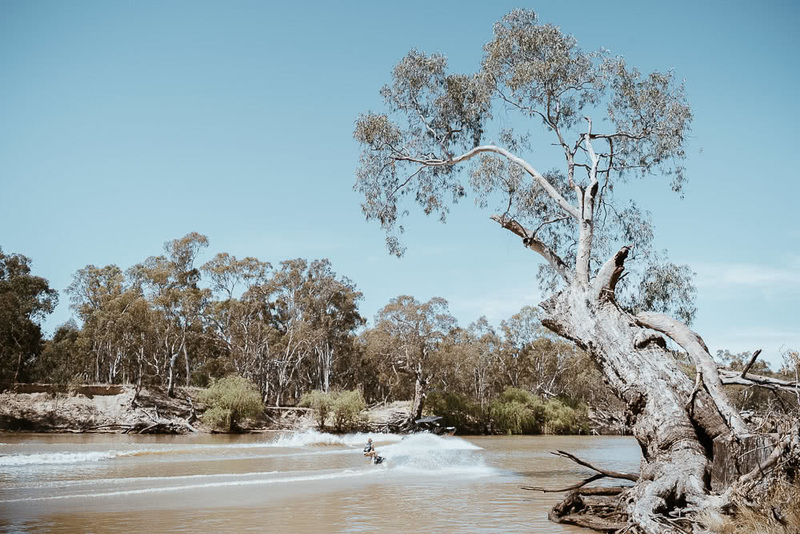 Deni’s in-town spot at Mcleans Beach is less crowded than nearby Echuca, but if you really need to clear the river to nail your 900, head to the ultra-quiet Benarca Bend 20 minutes out of town. If balance isn’t your strong point just jump on a kneeboard or throw yourself in a doughnut and compete for the best stack! 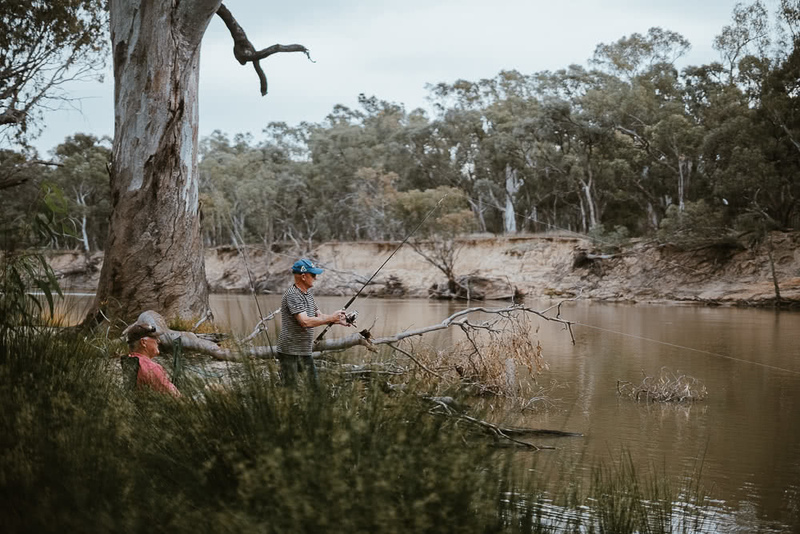 The Edward River is an anabranch of the Murray River, so it’s a prime habitat for the massive Murray Cod and the striking Yellowbelly. You can throw in a line from a boat or kayak, or fish from the shade of the riverbank. We recommend heading upstream from McLeans Beach and cooking up the spoils on the public BBQs. Make sure you’ve got a NSW recreational fishing licence, know the bag and size limits and throw back the fish you’re not eating! If you’re after some fish without the hassle, hit up Black Cat Café for their fish n’ chips and bring it down to the beach. Watch out for this bloke – loves a chippy. * The Pontoon doesn’t even require a boat licence! ** You’re allowed drink an alcoholic bevvie on the river, we checked. Don’t say we’re not good to you. We’re at risk of stating the obvious here, but the Edward River is bloody nice for a dip. Fresh water, hidden spots to towel off and get well-acquainted with your hammock and hot dry weather that makes the swim worth it, every time. Deni’s chockas with spots to pitch a tent or park your van. For prime position and a bit of comfort hit up Riverside Caravan Park (set on 12 acres of bushland) and let the bird songs lull you to sleep. 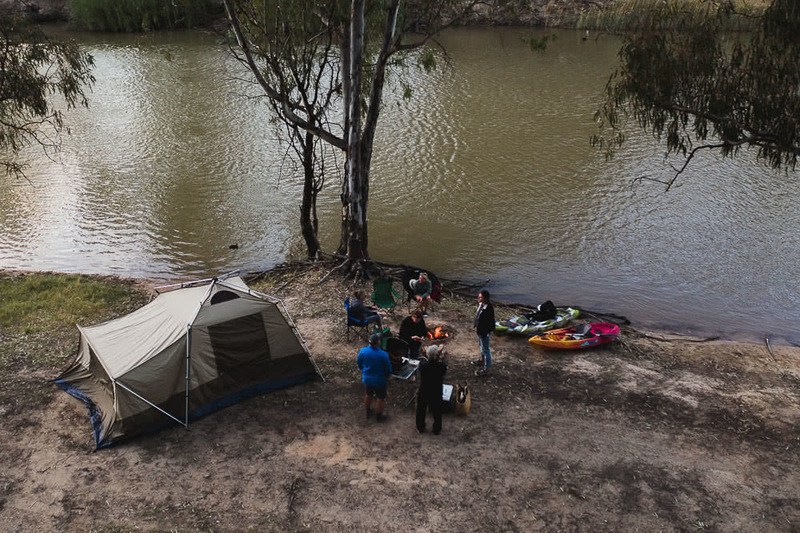 If you prefer to go bare bones, there’s free camping at Willoughby’s Beach Campground, Murray Valley Regional Park and heaps of water-access-only campsites upriver. This article was produced by We Are Explorers in partnership with Visit Deni. Make Deni a stop on your next trip!